Explanation on how to publish behind a Feather wallet. In this article we dive into the Pay-per-Article setup. 1. Add a new post and write your article just as you’re used to. 2. 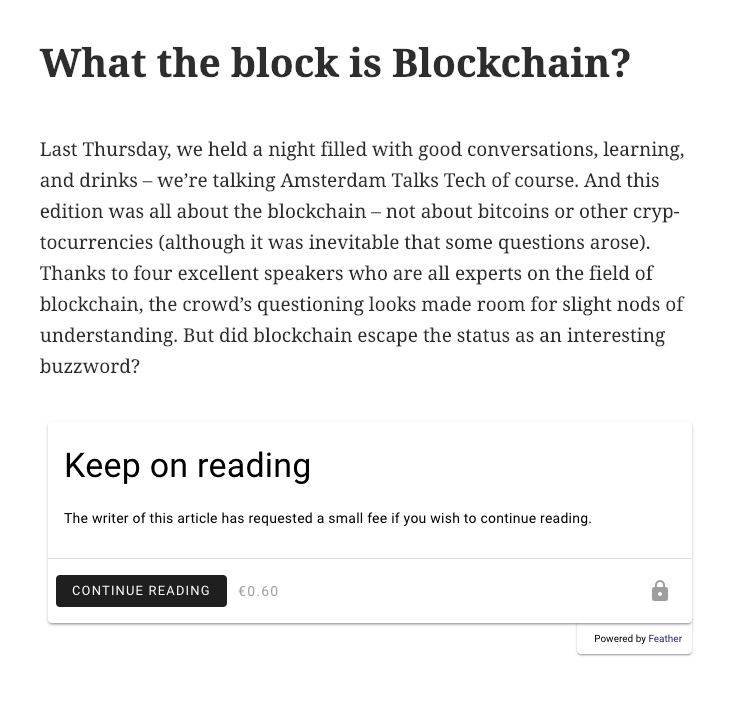 If you tick “Paid content”, this allows the wallet to appear on the article as a paywall once published. 3. Enter your preferred price in euros. Please note: do not forget the comma or period when setting your price if you would like to indicate a price in cents. For instance 0,50 and 0.50 represent 50 cents, 050 will mean your price is 50 euros. 💡PRO TIP: You can also set up a default price for all articles to be published if you like. Go to the Feather Admin panel and adjust the default post price. 4. Keep or change the number of paragraphs to show before the reader pays for your article. Please note: if you’d like to keep the same number of paragraphs for each article published in the future, you can change the default settings as described above. 5. Press ‘Publish’ and your article is now published on your website! The published article can be consumed for the price you’ve set. If you’re interested in learning about how this process would work, you can read this blog post where we explain step-by-step the consumer flow.